Uses pure freeze-dried acai powder with no flowing agents or fillers. 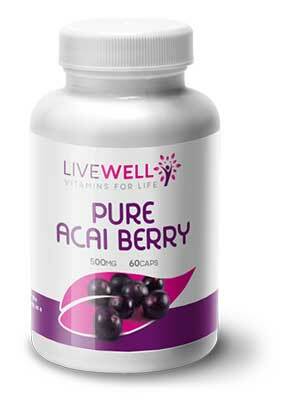 Each bottle contains 60 vegetarian capsules, with each capsule containing a full 500mg of acai berry powder. Ingredients: Acai freeze dried powder 500mg, HPMC Vegetarian capsule size 0. Suitable for those on vegetarian, vegan, Kosher and Halal diets. Take one capsule daily with a main meal.